They appeared on Earth 49 million years before we did. Their brains are large and complex. Their radar system - more powerful than any known to man. They are dolphins! And now, they need your help. This unique mammal is calling upon you and all her powers to outwit one of the deep´s deadliest predators. The longer the chase, the more frantic it becomes. 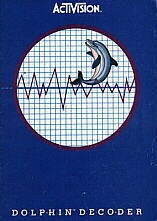 Sonar is the Dolphin´s code. A lone seagull, her only hope. And you. Are you listening`Each sound is your cue to act, to guide the dolphin in its treacherous track, through seahorses and undercurrents, away from danger. There is much to learn and not a moment to lose. The dolphins await, and so does - the giant squid.